If you are reading this, then you are thinking about joining or have already joined the millions of people worldwide who have decided to learn how to play guitar. There's a reason you're not alone. Playing an instrument - the guitar, in particular - is one of the most enjoyable things human beings are capable of. Music is in our DNA. Every one of us has enjoyed listening to music at one point or another, and the act of playing music - engaging in the act of creation and expression - is even more enjoyable. So rest assured, knowing you are making an excellent choice. No matter how many hours a human being has spent learning how to play the guitar - and there are many who have spend thousands of hours doing just that - no one has ever regretted it. Nor will you. The point is this: if you are still wondering whether or not you should bother learning how to play the guitar, stop wondering immediately. The answer is you should. Why? Because your life will improve instantly and dramatically as a result. Alright, so you've made up your mind and you've decided you are in fact going to learn how to play guitar. You may even have purchased a guitar recently, or perhaps purchased one a long time ago and have been watching it sit in your corner collecting dust. What now? How exactly does one begin the process of learning how to play the guitar? Playing the guitar is much like playing any other instrument, game, sport, or engaging in any other activity: the more you do it, the better you will become at it. So the first thing to note is that you shouldn't be surprised or get down on yourself if you're not an expert right away. No one ever is. The truth is it will take some time to build the hand-eye coordination, reflexes, knowledge base, and other skill sets required to master the guitar. But with enough practice, you too can play like a pro. Which brings us to the first and most important ingredient in learning to play guitar: you in a chair, dedicating yourself to the learning process. How long should you practice and how dedicated should you be? The answer to that question depends on what your goals are. If you are trying to become a professional musician (someone who gets paid to play or write music) then you should set aside more time to practice than someone whose goal is simply to be able to play a song or two around a campfire. Which brings us to the second point and lesson for the day: define your goals so that you may "begin with the end in mind." Write down on a piece of paper why you would like to learn the guitar. In other words, think about and record your goals. This will help you to understand what you need to do to make your goals and dreams become a reality. The next step is to talk to people who have already gone down a similar path. If you know someone who already knows how to play guitar, use that person as a resource. Ask him or her questions. Don't be shy. Find out what he or she did when first starting out. How much did he or she practice? What did he or she do right? What did her or she do wrong? What would he or she do differently if he or she had the chance to be in your shoes and start the process over? Is there something about this person's playing style that you like or are impressed by? If so, ask him or her specific questions about what intrigues you. Next, think about what style of music you would like to focus on. Do you like rock music? Folk? Heavy metal? Or something different? Think about what types of bands you would like to emulate, and think about what types of sounds, riffs, and styles you one day would like to master. Write everything down somewhere - on a piece of paper, or in a word document, or even in an email to yourself. By recording your thoughts, it will reinforce them in you mind and greatly improve your chances of getting what you want - in this case: learning how to play guitar. This free online series is intended to teach you the fundamentals of what you need to know in order to learn guitar. If you carefully go through each of the lessons in chronological order, you will at least know, in theory, the fundamental knowledge regarding what you need to learn, practice, and master in order to become good at playing the guitar. You should take your time, review, and practice at least 5-10 minutes a day for the first couple of weeks. Then you will, ideally, get in a routine. Once you have the basic knowledge, you will be able to always come back to the various sections to review things like chords, scales, and other things you will need to memorize. The course is broken into four main sections: the first section is introductory information and will get you up to speed on the basics: what you will need to buy before you can even begin, how you should approach the process of learning guitar, how to hold the guitar on your lap, and so on. The next three sections are intended to help you master the basic techniques that you will need to learn: playing guitar notes, playing guitar chords, and playing guitar scales. Once you have mastered those three fundamental techniques, you will be well on your way to guitar playing success. We hope you enjoy the free online teaching series. 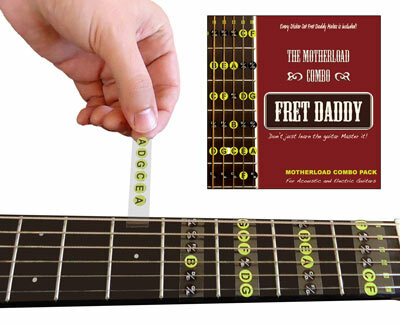 Please feel free to browse this website and see all of the great products Fret Daddy offers as part of its mission to help students learn guitar as quickly and easily as possible.